Dear people honoured by Jesus: Grace, mercy, and peace to you from God the Father and our Lord and Saviour Jesus Christ. Amen. We love places of honour. We like to be recognized as being important and distinguished. Who is there who would not like to receive a public award or recognition? Who is there who does not desire respect and admiration? Who is there who would not like to sit at the head table at a banquet; a place of honour at a feast? At first glance it might even seem like Jesus is giving us advice on how to get the admiration and respect of others at a party. When you are invited to a wedding feast, He says, go and sit in the lowest place, so that when your host comes he may say to you, “Friend, move up higher.” Then you will be honoured in the presence of all who sit at table with you. Before we say that Jesus is teaching us to pretend to be humble so that we will be exalted or that Jesus is teaching us how to look good in front of others, let us note how this teaching starts. “Now He told a parable to those who were invited, when He noticed how they chose the places of honour.” Jesus told a parable. Parables are earthly stories that teach eternal truth. Jesus used parables to teach about the kingdom of God. He used earthly things to represent heavenly things. In the parable of the sower, Jesus is not teaching us how to farm. In the parable of the net, Jesus is not teaching us how to fish. In the parable of the hidden treasure, Jesus is not teaching us how to be treasure hunters. Just so, in this parable Jesus is not teaching us how to be honoured at parties. Jesus is teaching us about the kingdom of God. Jesus is teaching us about humility and the wedding feast of the Lamb in His kingdom which has no end. Jesus is teaching us not to boast before God, but to be humble. The example of humility for us is of course set by Jesus. His humiliation includes that He was conceived by the Holy Spirit, born of the virgin Mary, suffered under Pontius Pilate, died, and was buried. 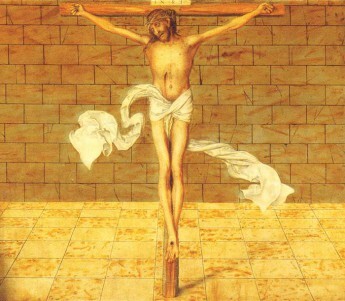 Our Lord humbled Himself to the point of suffering and death on a cross. Even invited to this banquet, Jesus did not choose a place of honour. He sat across from a man who had dropsy. Dropsy is called edema today, an illness in which your body swells with retained water, disfiguring it. No one wanted to sit by this disfigured man. I assure you he was not sitting in a place of honour. His illness made him unclean and no one wanted to be near him. His disfigurement undoubtedly made others around him cringe and turn their heads away from him. But his disfigurement didn’t turn Jesus away. Jesus reached out and touched the disfigured man. Jesus took him and healed him. Jesus took away his uncleanness and made the man clean. Your uncleanness because of your sin does not turn Jesus away from you either. Your sin which has spiritually disfigured you will not keep you out of the Lamb’s eternal wedding feast. Your sins which would make those sitting around you cringe and turn their heads away do not turn Jesus away. Jesus reaches out and touches you. Jesus takes you and heals you. He gives you His own body and blood to eat and drink, healing you and removing the disfigurement of sin. This is where humility before God comes in. Jesus says, “Those who are well have no need of a physician, but those who are sick. I have not come to call the righteous but sinners to repentance.” (Luke 5:31-32) Those who think that they are not disfigured by sin have no use for Jesus. Those who see the sins of others but think that they themselves are good and righteous do not come humbly to Jesus. They exalt themselves above others. Entry into the Lamb’s feast is not about comparing yourself to others and determining who deserves more honour or a better place. You will not even enter the Lamb’s eternal feast if you think you deserve to be there because of what you have done or left undone. If you look around and all you see are sinners worse than you; if you look around the world and see horrible sinners who deserve a lower place than you, you still don’t get it. Each one of us should say of ourselves, “I am the chief of sinners.” My sins are the reason Jesus died. I am guilty and disfigured by my sins and I do not deserve eternal life because of them. This is humility before God: seeing our sin and realizing we deserve only temporal and eternal punishment. What does God say of the one who humbles himself? God says “everyone who humbles himself will be exalted.” Everyone who recognizes his sin and comes to the eternal feast not based on his own merits but the merits of Jesus will receive eternal life. He will be exalted. He will receive a place of honour in the wedding feast of the Lamb which has no end. Jesus gives you a place of honour. Not because you’ve earned it, but because He has earned it for you. His life was for you. His humiliation was for you. His suffering and death were for you, so that you will receive a place of honour in eternity where God Himself recognizes you as important and exalted. Jesus already now gives you a place of honour. In the Lord’s Supper Jesus gives Himself to you. Jesus Himself serves you and gives you a foretaste of the feast to come. He gives you His perfect and holy body and blood to cleanse you of your uncleanness and forgive you all of your sins. The place of honour at the altar rail is for those who come in humble repentance over their sins who recognize their need for a Saviour. Jesus feeds you with Himself to strengthen you until He takes you to be with Himself at His eternal feast. There you will receive your place of honour and your host will not ask you to give your place to anyone else. There you will be honoured in the presence of all who sit at table with you. There God will exalt you, because Jesus humbled Himself for you. Amen.